This Thanksgiving, we want to share our genuine appreciation with you. Without you, we would not be where we are today, and we’re so thankful for all of your support throughout the year. 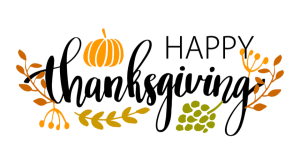 We’re thankful for wonderful customers like you this Thanksgiving. Our team has really enjoyed serving you this year, and we wanted to share our heartfelt appreciation. We hope you have a joyous holiday and we look forward to serving you again.